Last week, Facebook Business Page owners/marketers saw something that had most of them shaking their heads. Their post impressions dropped dramatically. What used to be the norm of 10%-12.5% of fans actually seeing your content dropped to about 5% or less. No one was quite sure why Organic Reach had suddenly dropped but we did see a Facebook blog about an algorithm change which means changes to what gets seen in a person’s news feed. This is a post for one of our clients posted on Dec. 11. 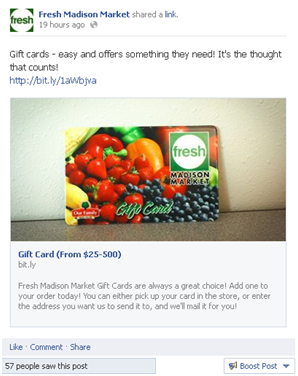 It sends people to the company’s website to purchase gift cards. Only 57 people saw this post. Now check out this post from November 29th, before the algorithm change. All it is a status update with no photo and no links…and, zero engagement…seen by 688 people. What is worrisome here is that Facebook has done several things. First, it has reduced organic reach for photos after earlier this year saying photos would get more reach. Facebook has then reduced organic reach for businesses who are promoting their own products on the page. We have always said that businesses SHOULD NOT try to sell product on their pages ALL THE TIME. But, there should be times during the week to offer products or sales or specials to try and get people into the store or buying online. In essence, because there are so many more people on Facebook now and there is so much information pushed through the platform, to stand out, you will have to pay. The question is, how much are you willing to spend? We have been suggesting to clients that we “boost” posts that are relevant to their businesses, particularly blogs that take people to the business website. If the blog is written correctly and funnels people to where the businesses wants them to go and then that leads to a conversion, paying for the post worked perfectly. For many clients, spending as little as $10 a week on a post shows immense reach; pages with 600 fans or less can see a reach of double or triple, to 1200 to 1800 people. It is important to note some pages that have had extreme engagement during the last few years will not see their numbers drop. Facebook has said these pages will continue to see organic reach around 12% of their fan base…think George Takei’s page. But, the free marketing product known as Facebook is over. Even if you think your content is engaging, and we think it is since we curate and create a lot of it, Facebook does not. While the algorithm will be tweaked over time, organic reach for business is going the way of the dinosaurs.